Sri City, January 11, 2019:- The Chennai Mathematical Institute (CMI), a research and education institute in Chennai, as a part of its expansion programme, explored the possibility of opening its unit in Sri City. 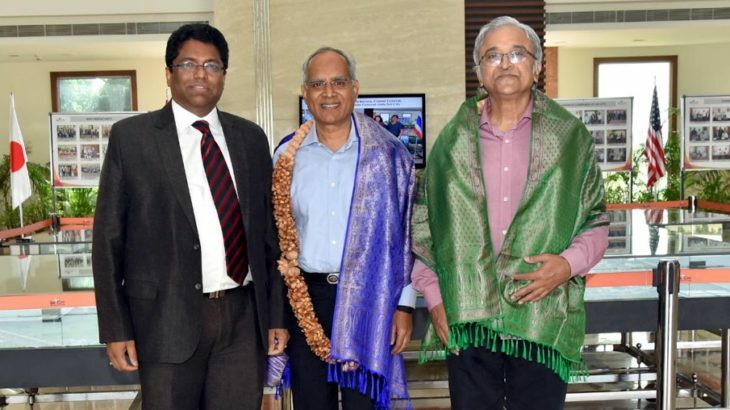 In this regard, the Director of the institute Dr. Rajeeva Laxman Karandikar and Mr. N. Lakshmi Narayanan, CMI Trustee, Emeritus Vice Chairman, Cognizant Technology Solutions, Chennai visited Sri City and had a discussion with its Founder Managing Director Mr. Ravindra Sannareddy. Welcoming CMI‘s proposal Ravindra Sannareddy appreciated the idea of setting up its unit amidst industries, and said that addition of CMI to the education sector of Sri City will be very useful as its research & education programme will immensely benefit the industrial units and also the students community. CMI is a rare example of public-private partnership in research and education in India. The Institute receives major private funding, side by side with substantial financial support from the Government of India. The main areas of research at CMI are Mathematics, Computer Science and Physics. In addition to a vibrant PhD programme, the Institute conducts BSc programmes in Mathematics and Computer Science as well as Mathematics and Physics, along with MSc programmes in Mathematics, Applications of Mathematics and Computer Science.